John Marwood Cleese (; born 27 October 1939) is an English actor, voice actor, comedian, screenwriter, and producer. He achieved success at the Edinburgh Festival Fringe and as a scriptwriter and performer on ''The Frost Report''. In the late 1960s, he co-founded Monty Python, the comedy troupe responsible for the sketch show ''Monty Python's Flying Circus.'' Along with his Python co-stars Terry Gilliam, Eric Idle, Terry Jones, Michael Palin and Graham Chapman, Cleese starred in four Monty Python films: ''And Now for Something Completely Different'', ''Monty Python and the Holy Grail'', ''Life of Brian'' and ''The Meaning of Life''. In the mid-1970s, Cleese and his first wife, Connie Booth, co-wrote the sitcom ''Fawlty Towers'', and starred in it, alongside Prunella Scales and Andrew Sachs. 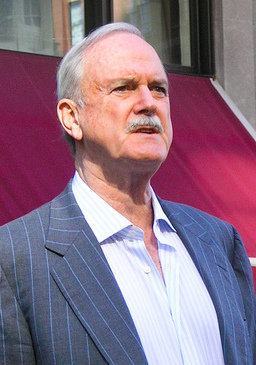 The series resulted in Cleese receiving the 1980 BAFTA for Best Entertainment Performance, and additionally it topped the British Film Institute's list of the 100 Greatest British Television Programmes. In the 80's and 90's, Cleese co-starred with Kevin Kline, Jamie Lee Curtis, and former Python colleague Michael Palin in ''A Fish Called Wanda'' and ''Fierce Creatures'', both of which he also wrote; for ''A Fish Called Wanda'', he was also nominated for the Academy Award for Best Original Screenplay. He also starred in ''Clockwise'' and has appeared in many other films, including two ''James Bond'' films (as R and Q), two ''Harry Potter'' films (as Nearly Headless Nick), and three ''Shrek'' films.